We have the tradition of getting our tree a little later in December, so that we can keep it up a little past New Year's Eve. A few years ago Big Brother started noticing other people had their tree up earlier than that, and started asking why we couldn't have one sooner. That's when we started the tradition of creating a cardboard tree. The fun of the tree is that each year we build it, paint it, and decorate it — and at the end of the season we recycle it. That way we get to start fresh the next year. It's great to keep in either the boys' room or the playroom after we get our real tree as it's a little smaller. And, this could be a great idea for a classroom or preschool where they might not have room (or money) for a real tree. Start with the two pieces of cardboard. 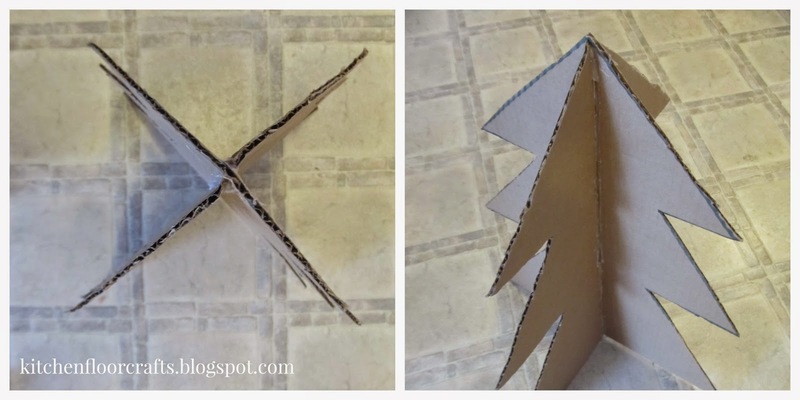 We've used scrap from package boxes or sheets of cardboard from former craft projects. They need to be about the same size, but do not need to be uniform. 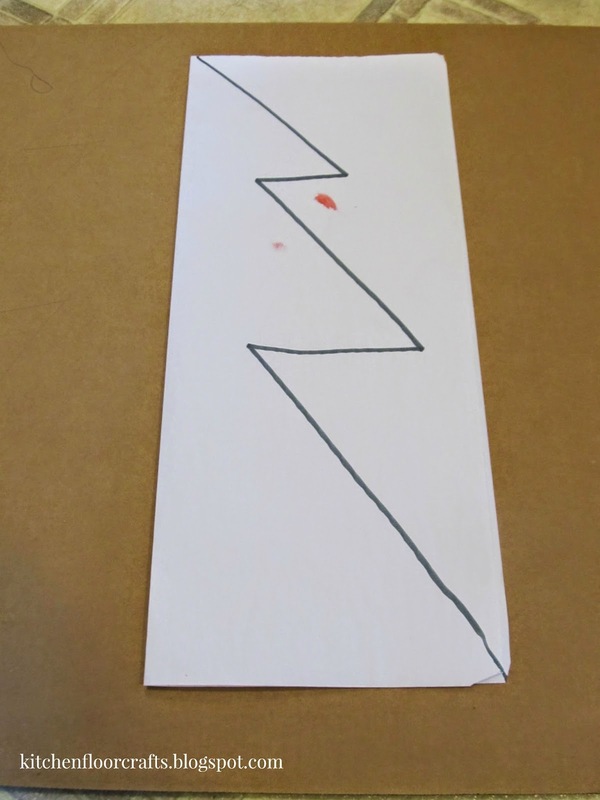 Fold the scrap paper in half and trace a tree shape onto one half. Cut out on the half line. It's important the two halves of the tree are identical (symmetrical.) 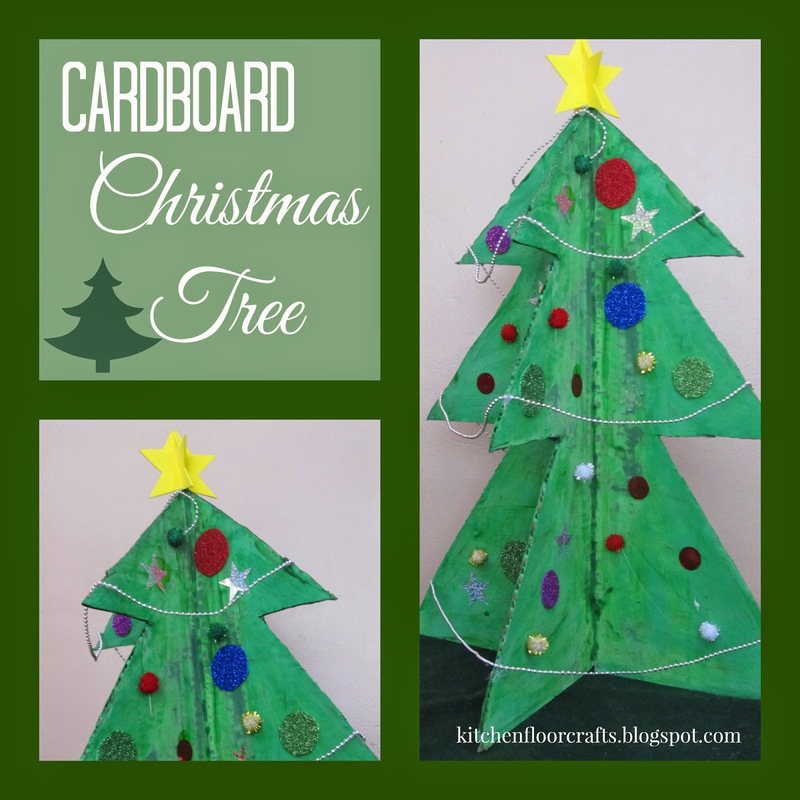 Unfold the tree and trace onto both pieces of card board. 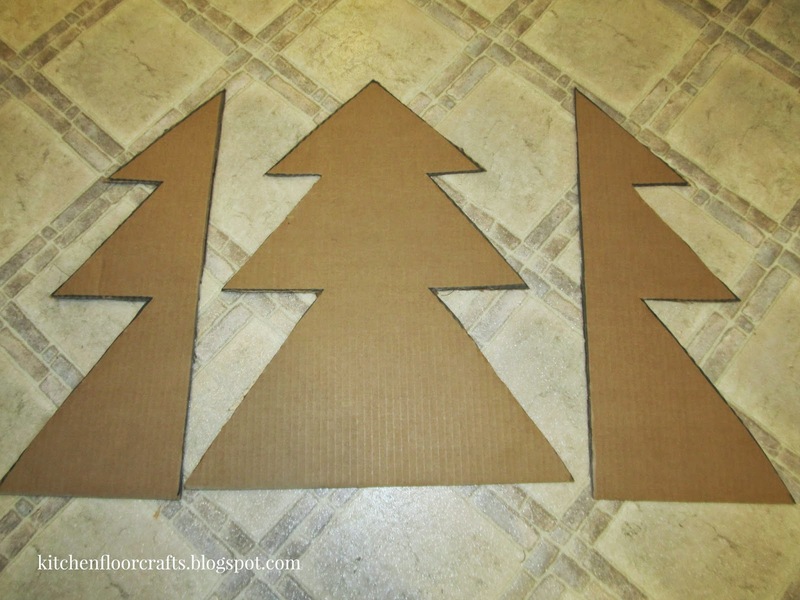 After tracing the template onto each piece of cardboard cut out the two trees. When cutting out the second tree, cut it in half vertically so that the two sides are even. Leave the first tree whole. There should be three tree pieces: one whole tree and two half tree pieces. 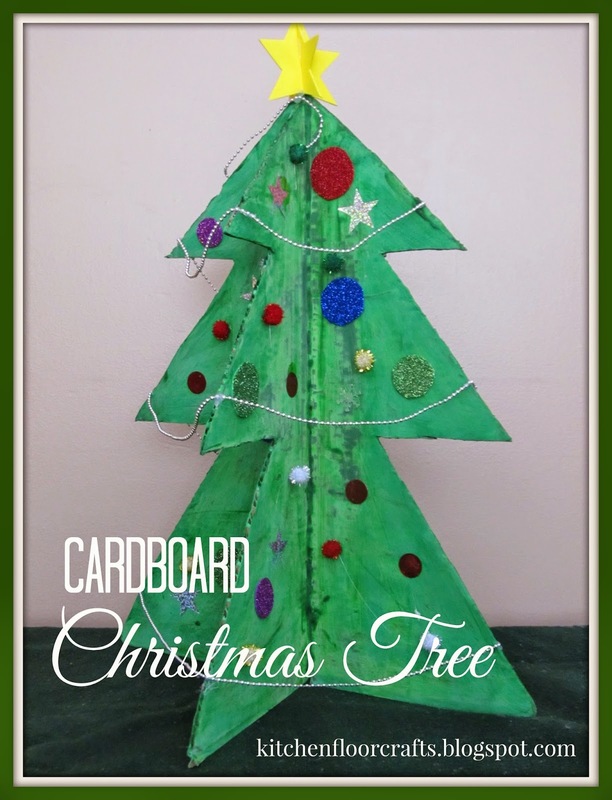 Use the hot glue gun to make a straight line down the center of the whole tree. Take one of the half tree pieces and place it on the line so it is standing up and it makes a right angle with the whole tree. Add more glue around where the edge of the half tree meets the flat side of the whole tree. Flip the whole tree over and repeat with the other half tree piece. When done, you should have a 3-D tree that can stand up. From the top, the four sides make an "x" shape. 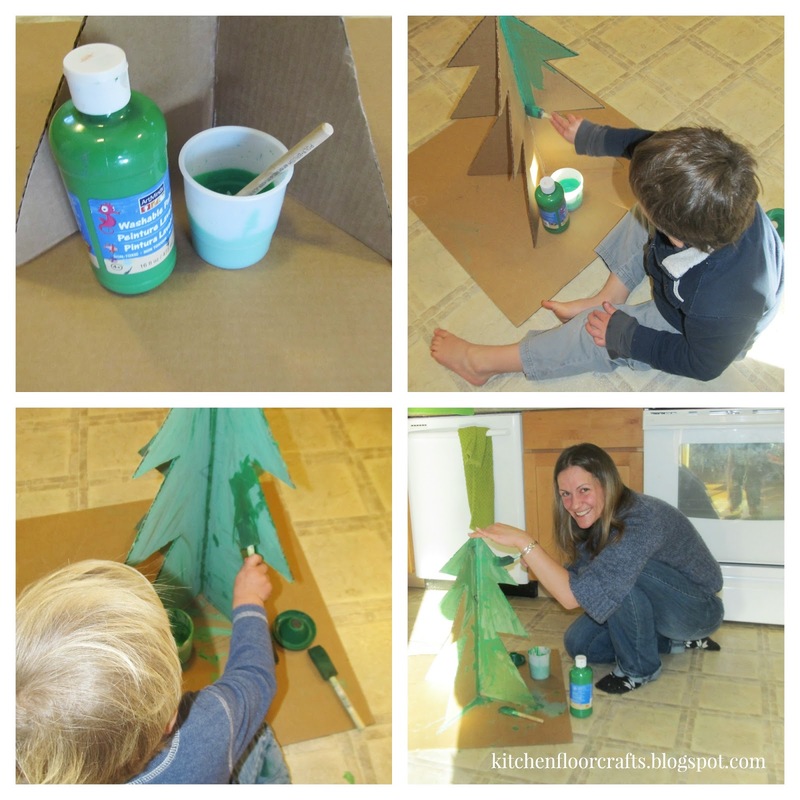 After the paint dries, which can take several hours or overnight, it's time to decorate the tree. There are lots of options for decorating. 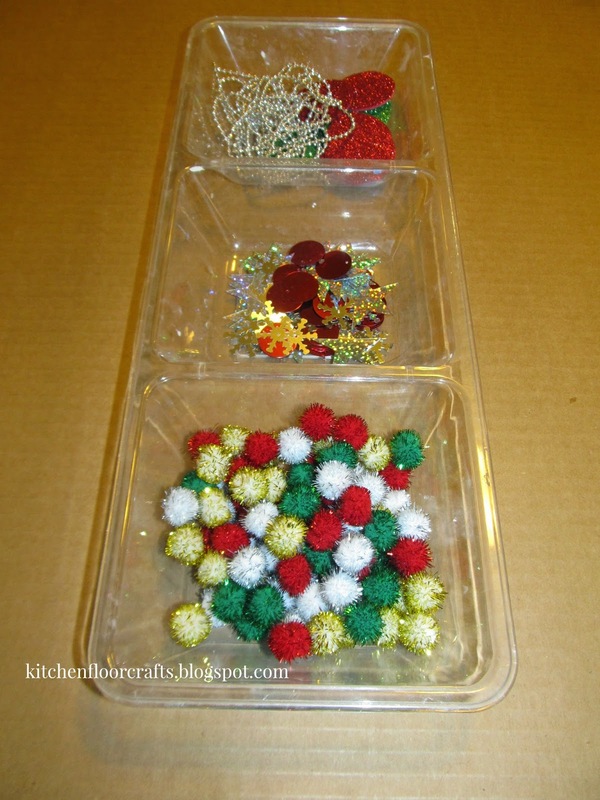 We like to use sparkly pom poms, large sequins, and plastic garland. This year I also cut shapes out of self stick glitter foam, which meant both boys could be hands on with the project. 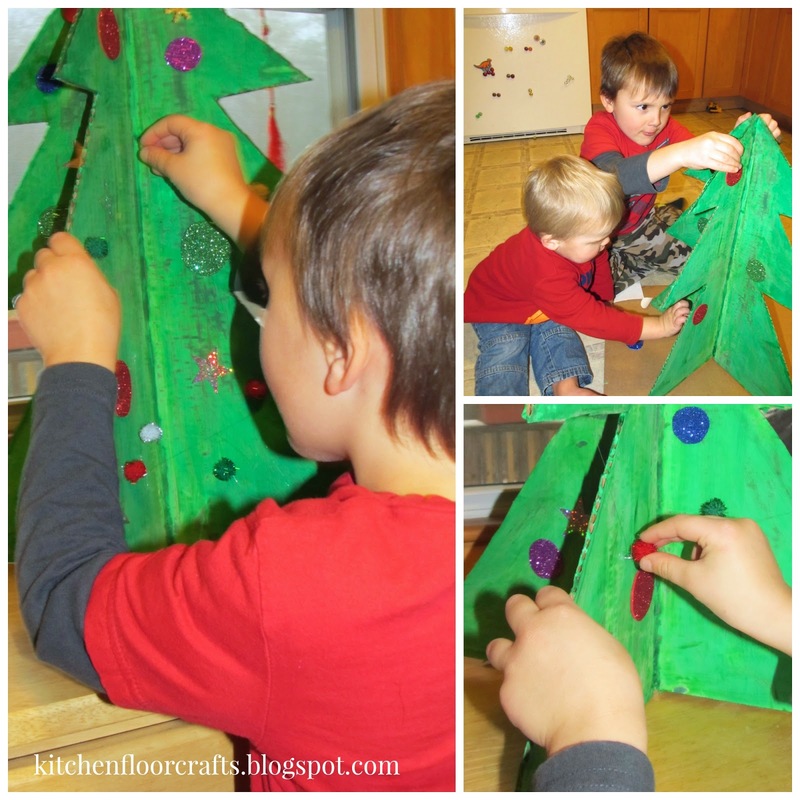 The boys stuck the craft foam shapes onto the tree and used regular glue to attach the sequins. I made hot glue gun dots onto the tree and Big Brother added the pom poms and garland onto the glue spots. This year I also created a 3d star for the top out of yellow craft foam and hot glue. Each year we switch up the add-ons a little, but it's always fun to have the tree while we wait to get our real tree and it definitely stays up as a decoration all season. What kinds of homemade holiday traditions do you have? Have you seen our new Homemade Christmas Pinterest board yet? This post has been shared at some of these great linkys.